If you’ve worked in a kitchen before, you’ll know that safety and cleanliness is paramount. 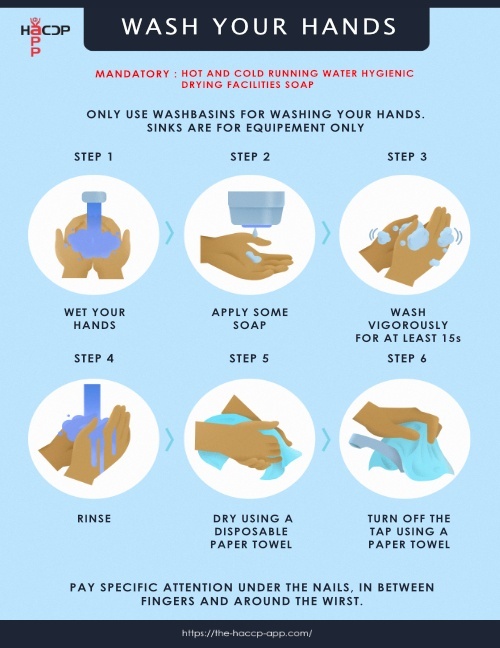 Since you are cooking and handling food that you will serve to a customer, proper handwashing techniques are a necessity. Ensuring that your staff adheres to these simple practices can help reduce food contamination risks, such as foodborne illnesses (and help you avoid a bad situation!). Here are some helpful tips, straight out of our Food Safety Code of Practice for Canada’s Foodservice Industry. This handy tool has information regarding health and safety practices, but also helps foodservice operators provide the best and safest environment to their customers. Purchase the Food Safety Code of Practice today! Bacteria and other contaminants are present on hands, especially on the fingertips and under the nail beds. While handwashing may appear as common sense, many food handlers fail to wash their hands thoroughly and as often as needed. If hands are not properly and frequently washed, there is an increased risk of contamination to the food and food contact surfaces. Employees involved in food preparation and foodservice must thoroughly understand when and how to wash their hands. Dry hands and wrists with a single-use paper towel. Use paper towel to turn off the tap (if not using a foot-controlled tap activation). Note: Never dry the hands on an apron or dishtowel as this could re-contaminate the hands. In addition to proper hand washing, fingernails should be trimmed, filed or maintained short so that proper hand washing will effectively remove soil from under and around them. If using a nail brush as suggested in #4 above – special care of the brush must be taken as it will have both soap and bacteria in it. To prevent re-contamination of the hands, the brush must be thoroughly rinsed clean with warm potable water then placed in an approved sanitizer solution having the required ppm; when not in use. For this reason most operators do not use a nail brush rather they use a microbial hand soap, eliminate the use of the brush and gain the additional advantage of hand sanitizing that soap and water alone does not provide.